Aaron Smith Wins the $1,000 Deep Stack Event! 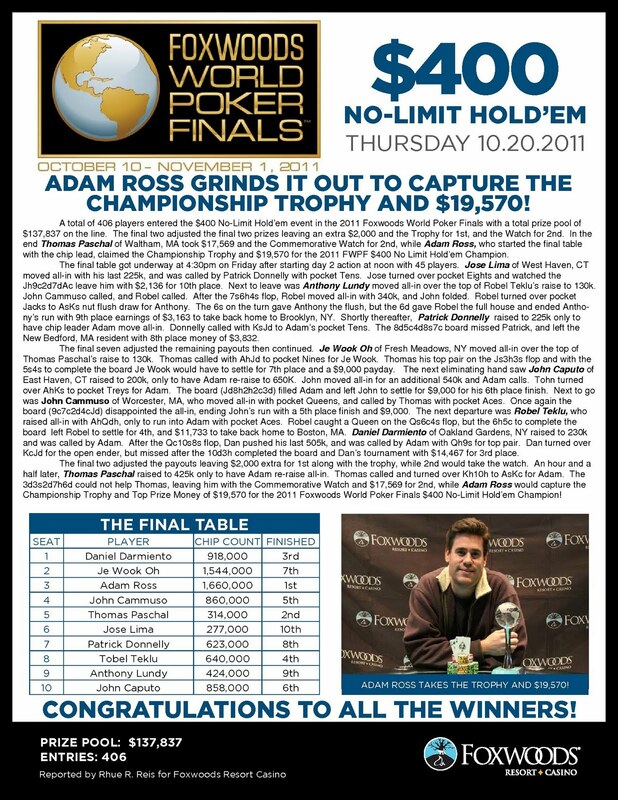 Aaron Smith is the champion of the $1,000 Deep Stack event at the Foxwoods World Poker Finals! He takes home $43,185, the World Poker Finals Trophy and the watch! On a board of [Ad][Jc][9c], Rob Garrett gets all-in with [Js][4c] against the [Ac][7c] of Aaron Smith. The turn is the [Kc], completing Smith's flush and locking up the pot. The [6s] falls on the river and Garrett is eliminated in 2nd place for $25,624. The board comes [Jh][7h][2c][Kc][Qd] and Smith wins the pot to eliminate Saunders in 3rd place for $16,665. A short stacked Jewook Oh gets all-in before the flop with [Kd][4s] against the [Ah][5d] of Aaron Smith. The flop comes down [4c][2d][2h] and Oh takes the lead with a pair of fours. The [7d] on the turn changes nothing but the [As] on the river gives Smith a pair of aces and the pot. Jewook Oh is eliminated in 4th place for $13,349. The board comes [8d][7h][5d][5h][Jd] and Smith improves to a flush to win the pot and eliminate Ruddy in 5th place for $10,124. Jeff Saunders raises to 45,000 before the flop and Paul Bernier moves all-in for 50,000 total. John Ruddy calls from the big blind and Saunders tosses in the extra 5,000. The turn is the [Tc] and the river comes the [8s]. Saunders improves to a straight and wins the pot. Paul Bernier is eliminated in 6th place for $8,243. 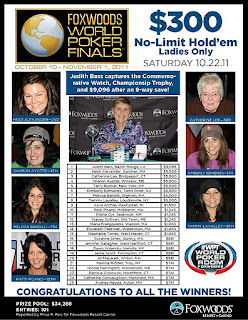 We had a total of 474 players in the $230 Super Bounty event at the Foxwoods World Poker Finals. 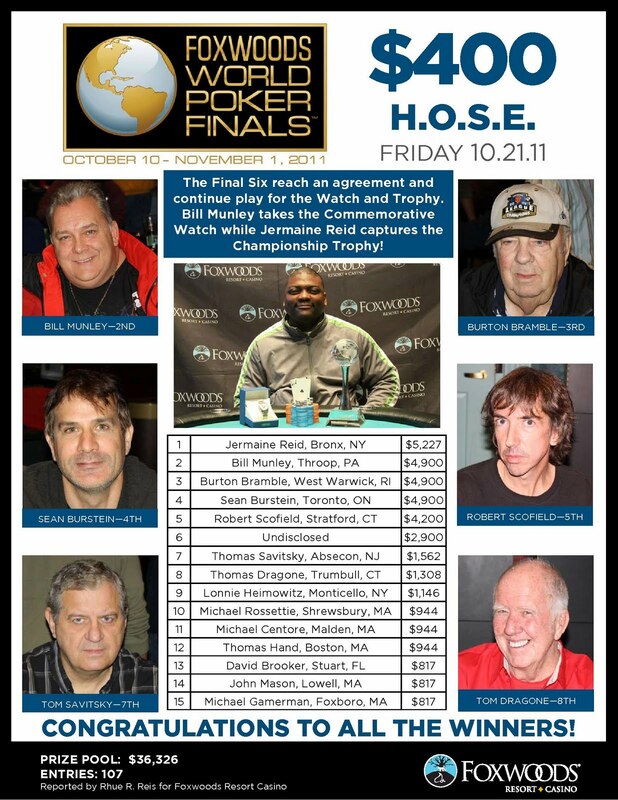 Robert Garrett raises to 47,000 before the flop and Jeff Saunders calls from the small blind. Ted Driscoll, in the big blind, moves all-in for an additional 48,000. Both Garrett and Saunders call and the flop comes out [Th][8c][6c]. The turn is the [Kd] and the river comes the [2h]. 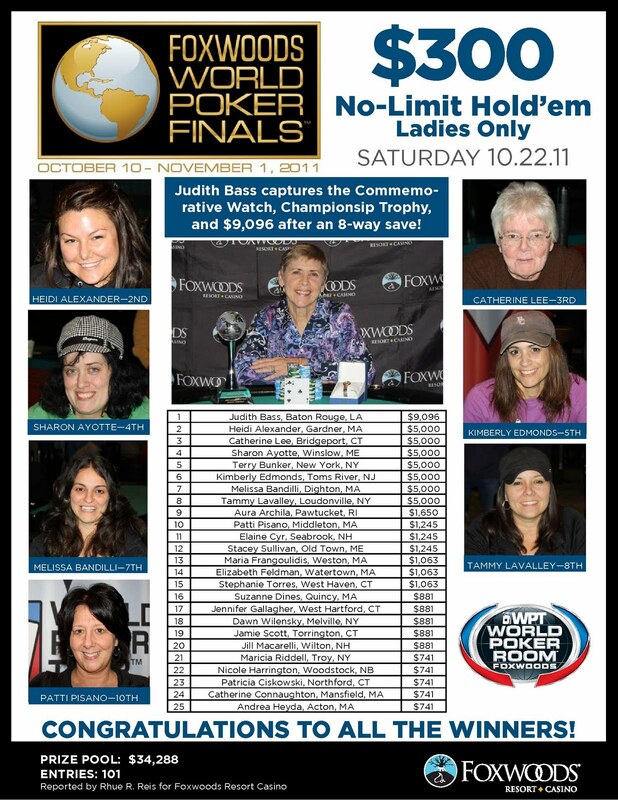 Saunders wins the pot and eliminates Driscoll in 7th place for $6,988. The board comes [Kh][9c][8c][2s][Jh] and Oh pairs his king to win the pot and eliminate Takeshita in 8th place for $5,734. The board runs out [Qc][Qd][3h][7d][Ts] and Oh wins the pot to eliminate Dentale in 9th place for $4,853. In a blind vs. blind situation, Brent DeBraga gets all-in with [Qd][Qs] against the [Ac][As] of John Rudy. The board runs out [Ad][9c][6c][5d][2c] and Rudy wins the pot to eliminate DeBraga in 10th place for $3,673. We have reached the final table of the $1,000 Deep Stack event. $230 Super Bounty Event is Underway! With a line of players stretching all the way into the casino trying to get registered, the $230 Super Bounty event is now underway. Players start with 20,000 in chips and the levels are 20 minutes in length. For every player you knock out, you earn a $100 bounty. We had a total of 310 players in the $500 NLHE Deep Stack event at the Foxwoods World Poker Finals. Final Day of the $1,000 Deep Stack Streaming Live! The final day of the $1,000 Deep Stack event is now streaming live. There are 20 players remaining and the blinds are currently 2,000-4,000 with a 400 ante. $500 Deep Stack Event Underway! 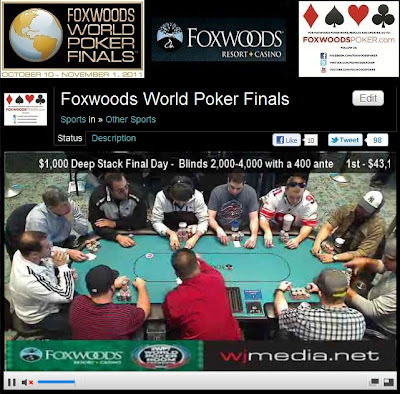 The $500 Deep Stack event at the Foxwoods World Poker Finals is now underway. Players start with 20,000 in chips and the levels are 45 minutes in length. Anthony Hill Wins the $1,500 No-Limit Hold 'em Event! Anthony Hill is officially the champion of the $1,500 No-Limit Hold 'em event. He takes home $76,823, the World Poker Finals Trophy and the watch! Phan has an gut-shot straight draw but Hill is in the lead with his pair of jacks. The turn is the [6h] and the river comes the [9d]. Hill's jacks hold up and Phan is eliminated in 2nd place for $45,584. Joe Liberta gets all-in before the flop with [8d][8h] against the [Kh][Qs] of Eric Phan. The board runs out [Td][Th][3s][Ts][Ks] and Phan pairs his king on the river to make a better full house than Liberta. Joe Liberta is eliminated in 3rd place for $29,645. On a flop of [Qd][4c][2d], Barry Rosenkranz checks and Eric Phan bets 125,000. Rosenkranz calls and the turn is the [Ad]. Both players check and the river comes the [Js]. Rosenkranz fires 225,000 and Phan moves all-in. Rosenkranz immediately makes the call and turns up [4d][4s] for a set. However, Phan flips over [Td][8d] for a flush. Barry Rosenkranz is eliminated in 4th place for $23,907. Harris has Phan dominated but the board runs out [Jh][7c][2d][Js][7s]. 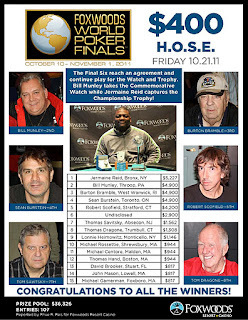 Phan makes trip jacks to win the pot and eliminate Harris in 5th place.